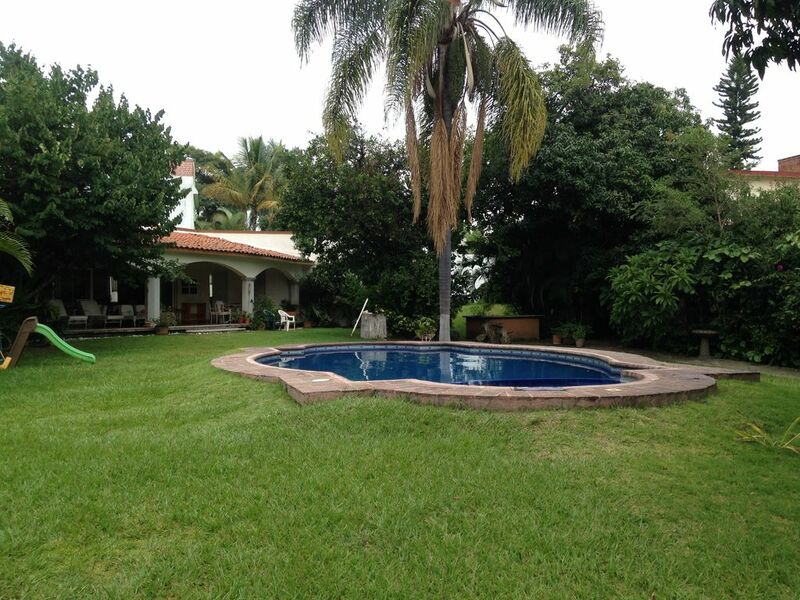 Beautiful Villa in Cuernavaca - This lovely 4 bedroom, 4 1/2 bathroom house is within minutes from public transportation and walking distance from supermarkets and stores. The home is in a gated street with a security guard. The home was built in the 70s, but was recently renovated. It is all setup in one story, so it is ideal for seniors and families alike. The home is decorated in a traditional Mexican style and there is beautiful original artwork throughout the property. This is a private, single-home estate. You won't need to share the wonderful pool/jacuzzi or the extensive back yard with other homes. This is a unique house built in one level, so it is great for seniors and families alike. All bedrooms have an en-suite bathroom. The house is built on 2,000 square meters of flat land, so the gardens and outdoor spaces are extensive and beautifully manicured including a lot of beautiful local plants and fruit trees. The house is wonderfully located closed to public transportation and grocery stores. It is 5-10 minutes from the main highway, but tucked away in a very calm part of town. There is a separate bungalow in the back of the house were the housekeepers live. She helps with the cleaning and he does the gardening. They will not bother you during your stay and will be of help if you need anything. The neighborhood is largely residential, however a few schools are nearby. The house has 2 covered parking spaces and in the back there is also an opportunity to have cars parked in the back yard if needed. The cleaning person could be hired for preparing meals if desired. Note: No parties larger than the max amount of people listed in the house details are allowed on the premises. A great place to stay, for a family or friends in a awesome town as is known city of eternal spring. I highly recommend it. Thanks so much Carlos. It was a pleasure working with you. La casa se ubica en un lugar muy centrico y sus cuidadores Sra, Esther y Santiago son muy amables y eficientes. La relacion calidad precio es correcta para la propiedad, como arquitecto basta decir que es una casa tipica y autentica de cuernavaca, con caracter e historia. La casa es perfecta para familias grandes y ninos, el tener bano en cada habitacion + un bano compartido en la estancia es un super plus, ademas de las amenidades como la mesa de pingpong, las hamacas, camastros, gran jardin y juegos de mesa, no tubimos la nesecidad de prender la televisio ni un solo dia al estar en este paradisiaco lugar. While visiting family in Mexico City, we decided to escape the traffic of the city and rented the Colonial House in Cuernavaca. You're never sure what to expect when renting a property on-line but the house delivered everything we needed for a relaxing week. The house itself is clean, spacious and comfortably slept 10 people (each of the 4 bedrooms had its own bathroom which is a great bonus). The pool/hot tub and ping-pong table provided hours of entertainment. The owner, Teresita and the on-site caretakers, Donia and her husband were very friendly and responsive to all our questions and requests. The location is gated with a security guard and is very convenient to restaurants, grocery stores and malls as well as touristy sites like the Animal Safari and Mayan ruins. I would highly recommend this house for rental. Thanks so much for your kind review of our property. It was a pleasure to welcome you to our home and I am very glad that you enjoyed Cuernavaca and your stay at our property. We would be delighted to welcome you again if you ever want to travel to Cuernavaca again. nicknamed "the city of the eternal spring" for its ideal weather. Columbian art and wonderful Diego Rivera murals. There are other wonderful places to visit in or near Cuernavaca. fantastic art crafts stores and markets. Cuernavaca is also home of great restaurants and shopping centers. Inquire if you need recommendations. Cancellation Policy: Cancellation can be made up to 2 months prior to arrival (written cancellation is required for a full refund). No refunds are made 2 months prior to arrival. The renter will be responsible for any extra expenses that result during his stay (phone calls, damages, etc). Minimum of 2 nights for this property. No parties larger than the max amount of people listed in the house details are allowed on the premises.